Google Reader is ostensibly just an RSS aggregator, a tool that lets you catch up on your favorite blogs. How could Google have anticipated that getting rid of its social features could have angered so many people who were actually using it as their default social network, and who enjoyed it precisely because it didn't function like Facebook or Google+? In some ways, using Google Reader as a default social network works even better than Google+ does right now. You didn't have to state your age to use the service. When some underage Google users unwittingly gave their age to Google+, they found themselves locked out of their Gmail account. There's currently no advertising, and there currently isn't any advertising in Google+, but brand pages are expected to launch soon. You can use a pseudonym without fear of getting your account suspended. Although the VPs at Google have confirmed that support for pseudonyms is coming for Google+, Google Reader never required "common names" in the first place. You can post your finds publicly or to a select group of people. You could try to replicate this in Google+ by creating a "Reader" circle, but it requires you to have at least two tabs open in order to comment or like the content you've shared. You can bookmark items in Google Reader with the star function. Currently there's no way to save content you want to track in Google+ except with some undesirable workarounds. You could share the content to an empty circle, or you could use Evernote, a note-taking application that provides you with a free email address, and shares content to that email address. You could use your shared items as a link blog. You can create and share "bundles" - your own recommendations for blogs to subscribe to on Google Reader. You can track all the random statistics you want about your subscription habits, including stuff you've clicked on, read, and emailed. You can share items directly to Facebook, Twitter, Blogger, or Delicious, which you can't currently do in Google+ without installing an extension or plug-in. 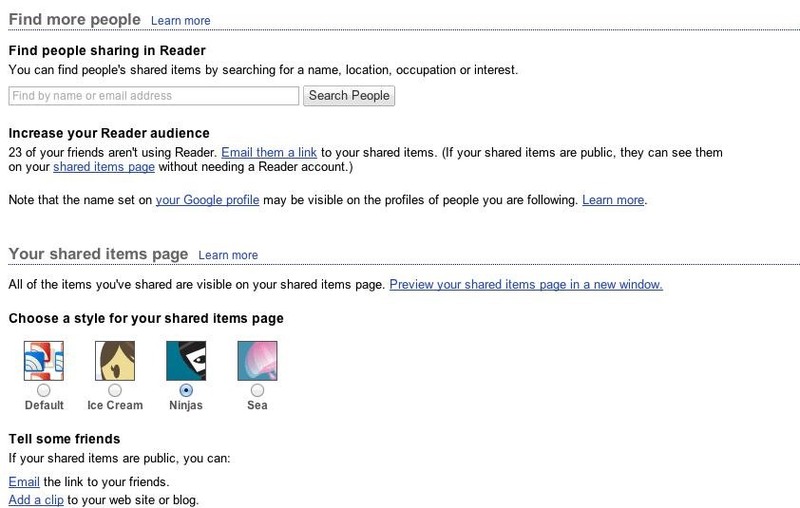 (1) In Google Reader, you can share items publicly or privately with the contacts you choose. (2) You can find people by name, location, occupation or interest, or share items via email or to your blog. (3) You could use your Google Reader shared items as a link blog. (4) You can track your reading and consumption habits. (Note, the reading trends figure for mobile didn't work. ), (5) You can make tag bundles of your favorite blogs to share with other Google Reader addicts. Upset Google Reader users are staging a protest today outside Google's Washington D.C. offices. On the official Facebook event page, users are posting their Google Reader stats: how many items they've read, shared, liked, and emailed. There's also a petition you can sign (on Google Docs, of course) if you want to keep Google Reader's social features as is. According to TechCrunch, the news also affects an unexpected group: the Iranians. In a country where many social networks are banned just by virtue of existing, Google Reader has been flying under the radar of the Iranian government. Power users like +Vahid HT have over 7500 followers, and provide spaces for arguments and discussions. The Google Reader Lexicon was set up a few days ago to explain to the world Google Reader communities and culture, including an explanation of "sharebro", as it pertains to Google Reader. If you want to catch up on the latest, check out the ShareBros website. +Francis Cleary is working on an alternative reader so that people can keep the same social features when reading their RSS feeds. Existing Alternatives to Google Reader? Unfortunately, Google Reader has been such a great product that most of its would-be competition have been shuttered or abandoned by their developers. Many RSS feed aggregators allow you to read content, but don't provide ways for you to share with an audience. I checked out a few that might fit the bill, though. Feedlooks might be in danger of going away, as the owner has decided to put it up for sale. However, it does provide a bunch of genuinely innovative features, along with the social sharing aspects that the sharebros value so much. You can deal with content overload by using the "interest meter" as a guide for the hottest and most popular items. Good Noows is a web app that lets you add and filter news sources (you can add blogs you follow), and share to social networks such as Facebook or Twitter. You can also share to your chat buddies. NewsBlur is a feed reader that does not currently have social features, but according to the creator, Samuel Clay, it's in the works, and he's actively soliciting feedback for what users want in a social feed reader.